See orangutans in the wild and at rehabilitation centers, learn about the lives of locals living in remote villages, stay on a traditional riverboat, trek through jungles to spot wildlife, and end your offbeat 14-day Indonesian adventure by relaxing and indulging in diving at Nabucco Island Resort. Embark upon your Indonesian adventure. Arrive at Pangkalan Bun Airport, meet our local representative and transfer to Kumai to board your private ‘klotok’ - motorized boat. This traditional wooden riverboat is about 12m by 2m with an upper deck from where you can see the rain forest as it glides past you. Your personal guide team includes a boatman, a cook, and an expert guide. Explore the quiet river to spot monkeys along the riverside. Later, check in to your comfortable room at Rimba Lodge, adjacent to Tanjung Puting National Park. 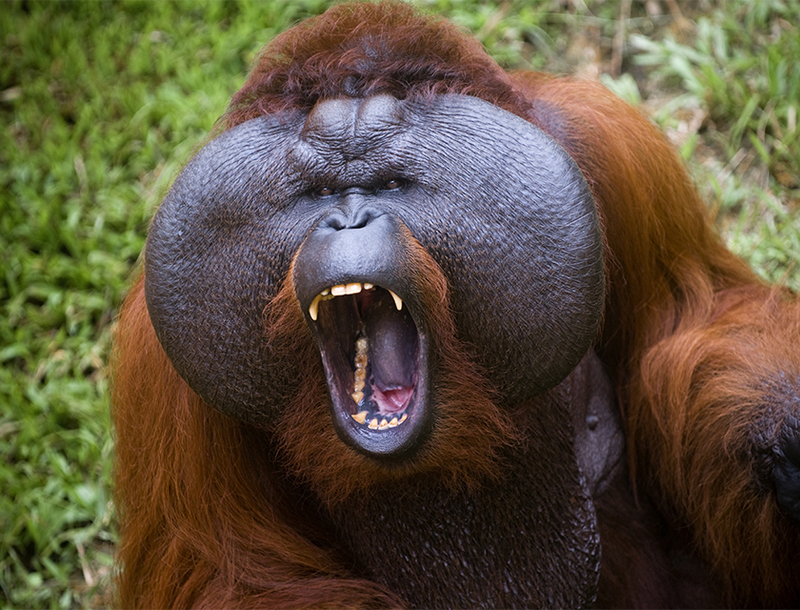 The Park is famous for its orangutan population in Indonesia. Proboscis monkeys, clouded leopards, civets, Malaysian sun bears, mouse deer, barking deer, and sambar deer can also be spotted here. The Park hosts over 230 species of birds, including hornbills, deep forest birds, and many wetland species. Look out for the Park’s famous “bird lakes,” seasonal rookeries for species of endangered waterbirds, including the only known Bornean nesting grounds for white egrets. Situated on the edge of the Park, beside the Sekonyer River, Rimba Lodge provides a base for seeing nine primate species. Spot orangutans, Proboscis monkeys, gibbons, and tarsiers amongst other species in their natural habitat. All the 32 rooms have fans and mosquito drapes as well as western toilets and showers. Electricity is powered by a generator that runs from 5pm to 8am. After breakfast, board the klotok to cruise up the Sekonyer River for about two and a half hours to Camp Leakey where older orangutans are reintroduced into the rainforest. This is also a research center for orangutans. Go on a short trek through the tropical rainforest searching for wildlife, birds, orangutans, other primates, and jungle plants. Return to the boat for lunch and later observe feeding time for older rehabilitated orangutans. After breakfast, board the klotok to travel up the river to Pondok Tanguy, rehabilitation center for recently released orangutans, and visit during the feeding time at 09.00. Hike through the forest of Pondok Tanggui in search of wildlife including wild orangutans and birds. Return to the boat and continue to Pesalat reforestation camp to see a reforestation project. In the afternoon, visit Tanjung Harapan Rehabilitation center to witness feeding time at 15.00. Return to the Lodge to rest or stroll around the Lodge and look for wildlife. Go on an optional night walk through an area in Tanjung Puting National Park. The trail is along flat ground and mostly on formed trails but may be wet and boggy in places. If smaller trails are taken, looking for the sites of mushrooms, the ground could be uneven, with tree roots and fallen branches. After breakfast, transfer to Kumai and then to the airport. Take a short flight from Pangkalan Bun to Sampit. Upon arrival, you’ll be driven to Palangkaraya. Arrive at Palangkaraya at around 3pm and transfer directly to board the Rahai'i Pangun, which will be your home for the next three nights. 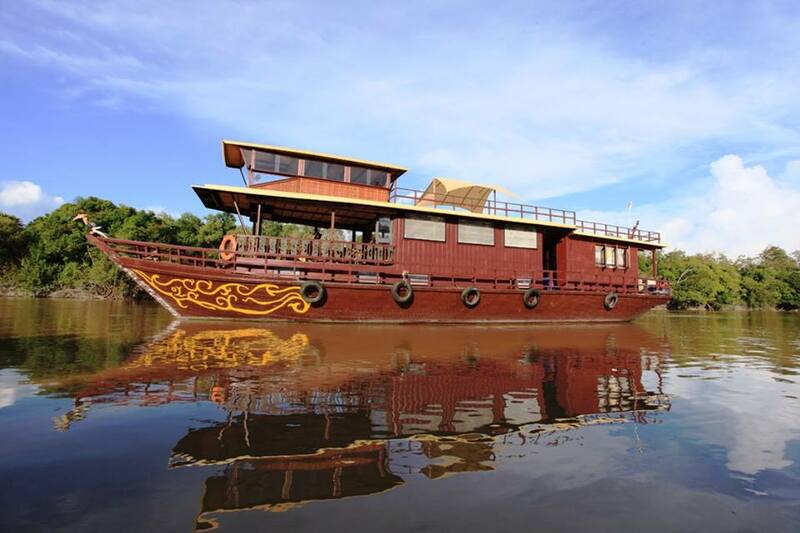 The Rahai'i Pangun is a 20 meter x 6 meter traditional Kalimantan riverboat known as a Rangkan that has been converted into a beautiful boat with five double cabins and two large viewing decks. The boat passes Pulau Kaja, orangutan release island, and then continues upriver to the small riverside village of Kanarakan. The indigenous people of Kalimantan are collectively known as the Dayak. The three major Dayak tribes in Central Kalimantan are the Ngaju, Ot Danum and Ma’anayn. The village of Kanarakan is made up of the Ngaju tribe. The villagers welcome you with a traditional ceremony. As evening falls, stroll around this tiny hamlet while meeting the villagers. Early in the morning, the boat moves down river, passing the orangutan release island of Pulau Kaja. Stop at Tangkiling for an optional climb up to Tangkiling Hill for a view of the surrounding plains. After the climb, return to the boat and enjoy a relaxing cruise down river, passing Pulau Pallas, where you will see orangutans in the lush jungle on the island. Transfer by canoe to the BOS Orangutan Foundation’s Education Centre in Nyaru Menteng. Accompanied by experienced technicians, observe baby orangutans behind glass in the socialization cages and watch a film of BOS projects in Central Kalimantan. The additional cost of the tour is given as a donation to the BOS Orangutan Foundation. Before sunset, take local canoes into the lake to spot wildlife, see local fishing activities, and marvel at the black waters. Continue along the Kahayan River, arrive at Bukit Rawi by mid-afternoon. Walk through this historic town and learn about the Dayak ancestral bone houses and the Tiwah or funeral ceremony. Dinner is served on board, followed by an evening of traditional entertainment. Cruise to Palangkaraya early in the morning and enjoy breakfast on the way. Transfer to a car and make a short stopover in the handicraft market, before making the four-hour overland trip to Banjarmasin, the capital of South Kalimantan. It is located on the junction of the Barito and Martapura Rivers. The city is laced with flood-prone waterways and many houses are built on rafts or stilts over the water. Many of these waterways are also used for travel using relatively small rowboats (only major rivers are accessible by larger speedboats, tugboats, longboats, and barges). Later, check in to your hotel. Take a Diamond Tour to visit the diamond mining area in the Barito River Delta and see the process of digging diamonds at Cempaka Village. After this, drive 15 minutes to Martapura town to visit a diamond polishing/cutting factory, and later the souvenir market of jewelries and handicrafts. The complete tour takes four hours. Alternatively, take the one and a half hours Canal Tour. Banjarmasin has often been called the Venice of the East. The Canal Tour takes visitors through the maze of canals on a tributary of the Martapura River in the late afternoon by a motorised canoe to witness the way of life along the riverbanks. Depart the hotel early for a five hour car journey. Transfer to a large local motorised canoe to visit Pandak Daun swamp village in the afternoon to observe the villagers' unique activities and see water buffaloes swim to their raised enclosures. After sunset, return by car to Banjarmasin. Rise early in the morning and visit a floating market to see clusters of colorfully dressed Banjarese women trading their fresh garden produce from boat to boat on the Matapura River. Then transfer to the airport and fly to Balikpapan. Travel by car to the Hanging Bridge at Bukit Bangkirai, standing 40 meters high over beautiful forest treetops. Transfer to Samarinda later for dinner and check in to your hotel. Situated on a hilltop amidst tranquil greenery, Hotel Mesra International is located in the heart of Samarinda. Each room has individually controlled air-conditioning and is equipped with bathtub/jacuzzi, international direct dial telephone, internet hot-spot, multi system television with satellite program and in-house video movies, radio, mini bar and balcony/terrace. After breakfast, drive to Kabo village in Kutai National Park for a cruise up to Mentoko by motorized canoe. Go trekking in the jungle to observe wild orangutans. In the afternoon, trek along different trails and look for orangutans and other wildlife. Lunch will be served en route and dinner is at the hotel. In the morning, cruise down the Mentoko River back to Kabo village. Transfer to Samarinda, take a flight to Berau at 15:30 and check in to your hotel. The rest of the day is at leisure. Transfer by speedboat to Nabucco Island Resort. 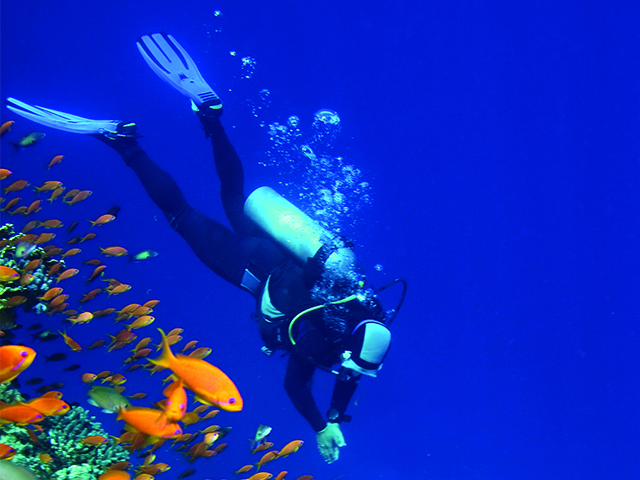 Relax on this beautiful coral island and enjoy 6 dives at different places over the next two days. Nabuco Resort is situated off the east coast of Borneo, in the Sulawesi Sea. There are eight double bungalows and one single bungalow in traditional Indonesian style here. Around the island are a few small beaches where visitors can swim and sunbathe during high tide. During the construction of this resort, the natural vegetation was preserved so as to not disrupt the ecology. As a result, coconut crabs still call Nabucco their home, and monitor lizards, king fishers, flying foxes and different kinds of small lizards still inhabit the island. The airy and roomy restaurant is constructed on stilts directly over the sea. In the evening, the starry sky over the Sulawesi Sea is the perfect ambience to enjoy the freshly prepared five-course dinner. Breakfast and lunch are served "a la carte". The bar is situated on a small cliff, overlooking the sea. This is the perfect place to enjoy the sunset and the moonrise while having a cocktail with friends and other guests. Today your Indonesian Wildlife Tour comes to an end. After breakfast, transfer via speedboat to Berau and then on to the airport for your onward journey.